These past two months have been a whirlwind of vibrant pink activity! I'm pleased to bring you the action-packed Roseroots Report for both February and March in this blog post, along with specific actions you can take to keep moving forward on our important work to end war. Bring our War Bucks home! Maine CODEPINK coordinator Lisa has been hard at work coordinating actions to bring the cost of war home and call for ending war funding. In February Maine activists held a Draw-a-Thon in the state capital that showcased the works of over 40 artists who depicted what the 2.5 billion spent by Maine taxpayers on the wars in Iraq, Afghanistan and Pakistan could have bought instead. This week the Bring Our War $$ Home Campaign had a victory when the Portland, ME city council passed a resolution asking the US Congress to "END THE EXPENDITURE OF OUR CITIZENS' TAX DOLLARS FOR EXCESSIVE AND UNAFFORDABLE WAR FUNDING." Contact Lisa to find out how to pass a resolution in your city. Throughout California CODEPINKers joined student and teacher - led rallies to protest college tuition hikes, pink slipping teachers, and education budget cuts with our message "fund education not occupation!" Many CODEPINKers also rallied for healthcare reform and moving our Pentagon bucks to health and healing. Brown bag lunch vigils at Congressional offices took place in February and March at districts around the country. Detroit's "bbl" has doubled in size every month - the most recent vigil drew over 60 people! Way to go Joellen and the Detroit team! The next vigil is set for April 21. Find a vigil near you! We mourned the milestone of the 1000th US death in Operation Enduring Freedom with vigils and sent letters to General McChrystal in early March. The Boston action report included a quote from CP coordinator Sarah. On the 7th anniversary of the Iraq occupation, March 18-20, CODEPINKers brought cost of war messaging to rallies and marches around the country, from Phoenix to East Central Florida. After the peace march in DC, we held an evening event with Eve Ensler, Amy Goodman, and other phenomenal women peacemakers. See photos and news coverage. >> Inspired? Tax Day, April 15, is right around the corner. Draw attention to the cost of war taxpayers in your city are paying with a visual action outside your post office to educate last-minute tax filers about how their tax dollars are being misused or write a letter to the editor. Good resources: Tom Engelhardt's piece on "believe it or not" military spending, Dana's pie image, War Resisters League downloadable Pie Chart, National Priorities calculator. Benjamin Franklin once quipped: "In this world nothing can be said to be certain, except death and taxes." Unfortunately, in the case of U.S. funding of war, the two are inextricably linked. The Teabaggers will be out with a vengeance on Tax Day. Here's our opportunity to spread the "fund healthcare not warfare" message. Barbara Harris wrote an excellent report on NYC CODEPINK's counter-recruitment efforts at the annual Parent-Teacher Night in New York City. Thirty-five volunteers participated in the action and were present at 11 high schools throughout the city. Teams included a group from the Lower East Side Girls Club, Peace Action Staten Island at two high schools, and volunteers fluent in Spanish, an asset in outreach to many parents. Their leaflet, "Options for Life after High School" went like hotcakes! And at the end of the event a new volunteer asked, "When is the next action? Please call me again." CODEPINK registered and submitted a workshop on defunding war machines for the US Social Forum. 18 CODEPINKers signed up to join our delegation and we welcome more people to join us at this Midwest gathering where we hope to create an art installation to bury the Hummer (which just went out of business!) and demonstrate the growth of the green and peaceful economy! Ground the Drones campaign organizer Nancy spoke on drones at the Network of Spiritual Progressives conference in SF and attended a protest of drones manufacturers in San Diego. She is co-organizing an action set for May 18-19 to protest General Atomics in San Diego. Plus, she marched as a drone in the DC anti-war march. Medea and DC Area CODEPINK have been working hard to keep creepy military contractor Northrop Grumman out of DC… and they may have a victory, especially after we put the pressure on the DC City Council and sent them hundreds of emails from our national alert - stay tuned for details in the coming weeks ahead! Yoo should be in jail! Whether at book events, outside their homes, or by educating with our new card deck, CODEPINK is holding war criminals accountable! Protests outside "torture author" John Yoo's home in Berkeley, CA, continued and were covered in the SF Chronicle, along with demonstrations when Judge Jay Bybee held court in San Francisco. The man who lied us into war in Iraq, Karl Rove, is on a national tour for his new book Courage and Consequences and we are hot on his trail wherever he goes, from Houston to Fort Worth to San Luis Obispo to San Diego, with a clear message - criminal actions must have consequences - arrest Rove! When Rove spoke in Los Angeles he was confronted by CP cofounder Jodie, Ground Truth director Patricia Foulkrod, and Dede, the aunt of Casey Sheehan, who boldly staged a citizen's arrest of Rove on stage. Now there's courage and real consequences! This action got amazing coverage in the mainstream media. See the video and get inspired to stage your own arrest. Plus you can post Fox News' Megyn Kelly going CODERED on Jodie to your facebook! >> See if Rove is coming to your city and stage a citizen's arrest. Rae is here to help in any way. >> Order a deck of war criminal cards and host a card playing house party! On March 8, from Tucson to San Antonio to Brooklyn, we joined with Women for Women International to march across bridges in solidarity with women survivors of war around the world. Perhaps the most moving International Women's Day report was the one that came in from the country that houses US Central Command: Bahrain. Christine Hasan reported that in Muharraq, Bahrain, Arabian Gulf, "We organized a photo shoot at our premises as we are a nursery and we could not take the children out to a bridge. We had boards in Arabic and English stating 'We are Women, Mothers and Sisters. We build bridges of peace every day. Join us in peace and understanding.' Our students decorated large cup cakes with Pink icing (for Code Pink), which teachers, mothers and students representing in all 10 nationalities gave out to ladies in the neighborhood... It was an amazing morning; filled with fun laughter, new friendships and that elusive thing, peace." Read Rae's full International Women's Day report on the PinkTank. >> Save the date! Our next major holiday to organize on is Mother's Day weekend, May 8-9, the day we women gather to end war! Join us in DC to transform the Military Arms Fair on the Mall or coordinate a gathering in your city to sell peace pies - more info coming soon! Gonna wash Ahava right outta these stores! 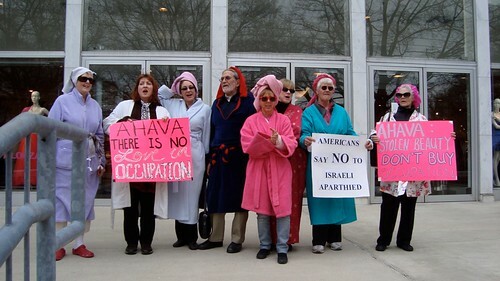 NYC CODEPINK coordinator Nancy would like to thank you for your help with our efforts to pressure retailers Nordstrom and Ricky's NY to stop carrying AHAVA products, which are made from stolen resources on occupied land. In February, we generated over 1,700 letters to Ricky's CEO Dominick Costello, and in late March 2,400 people sent messages to Nordstrom's Vice-President for Social Responsibility Linda Peffer, imploring them to live up to their socially responsible business ethics and stop carrying Ahava. Nordstrom has sent personal e-responses to some letters, stated their upset of the store action in Seattle, started following activists protesting them on Twitter (! ), and the pressure continues. We know that this flood of e-mails got their attention; in fact, Dominick Costello called to discuss our campaign, although he still won't commit to dropping AHAVA. To mark the Second Global Boycott, Divestment & Sanctions (BDS) Day of Action, which coincided with Palestinian Land Day on March 30th, Ahava boycotters staged protest actions in Arlington, VA, Washington, D.C., New York City, Boston, Montreal, and Los Angeles. You can read Prerna's blog post and see some moving (and hilarious) videos of these actions and read Rae's thoughtful post about the connection between Passover, profiteers and AIPAC. There was also excellent coverage of our Ricky's NYC protest and the Stolen Beauty campaign in The Indypendent. And from San Francisco to Sacramento to Indianapolis, boycotters delivered letters to store managers asking them to stop carrying Ahava. The American Israel Public Affairs Committee (AIPAC) held their annual conference in DC March 21-23, drawing thousands to lobby for sanctions on Iran and military aid for Israel, and CODEPINK was there to protest the occupation of Palestine, and the expansion of the settlements specifically, with street theater, inside disruptions, a spoof press release, and Congressional settlement actions! And in Arcata, CA, CODEPINK coordinator Carilyn took proactive actions to work for peace in the Middle East: the local WILPF/CODEPINK group just awarded $500 to a campus coalition of Jewish and Arab students and their friends for a Peace in the Middle East Festival which included round table discussions, speakers, break out groups, arts, dancing and food. They also donated $500 to Partners in Health for Haiti. The group earned the funds through an annual used book sale on 4th of July and an annual quilt raffle. In Bend, Oregon, CODEPINKers staged a creative protest in response to the Supreme Court's ruling that basically sold elections to corporations; their action featured "Chief Justice Robber, Injustice Allota Moola, Injustice Skullia, and Injustice Kennedy". Arizona CODEPINK has been working hard on immigration reform and CODEPINKers in DC joined the national immigration reform march on March 21. Over the past two months new local groups have sprouted in Montreal and London, Canada, Williams, AZ, Spokane, WA, and San Diego CODEPINK was revived! Toronto coordinator Dre started a national CODEPINK Canada group on facebook. And we'd like to welcome Prerna Lal to the central CODEPINK team - Prerna is our new online organizer and can support all your netroots neets! At the end of March we had a lively dialogue on our listserv about where to put our energy and priorities. Maine CODEPINK coordinator Lisa wrote, "I love CP and this dialogue. You all have educated me so much… Draconian budget cuts have a way of making folks finally sit up and pay attention, and it is crucial to help shape their perception of "what's wrong with this picture?" when talk radio shows spew out bad analysis and incite violent responses as a matter of course. For this reason I am increasingly motivated to teach nonviolent methods and have a teach-in planned for April 17. Thank the goddess for the true grassroots democracy of CODEPINK! The leadership of some of the most active members around the Israel BDS movement has helped me understand events better, and I am free to respond with messages I think are the best fit for my local audience." Here's to the rainbow of pink hues that create our CODEPINK community and color our actions for change!